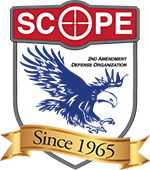 The Ontario County Chapter of SCOPE will have its Monthly meeting on February 18th, at 7:00 PM, at the Elks Lodge, Niagara Street, Canandaigua. We have projects to work on: we have a committee formed (that needs more members), to support High School trap shooting teams. We will be having a gun raffle, to support new teams that are being formed. We are forming a committee, to contact all the gun clubs in Ontario County, to keep them informed and get them involved in supporting the Second Amendment. We are also forming a committee, to apply for NRA grants, to support the High School shooting teams. We look forward to seeing you at the meeting, because we need more bodies, to do these actions.